Globe Life Park is the site of the matchup between the Houston Astros and the Texas Rangers on Tuesday, September 26, 2017. The probable starting pitchers are Dallas Keuchel for the Astros and Cole Hamels for the Rangers. Houston opens at -123 while Texas opens at +113. The Astros have a 76-70-9 over/under record and a 81-74-0 run line mark. The Rangers are 86-69-0 against the run line and have a 69-80-6 over/under record. The Astros have a 95-60 overall record this season. Starting pitcher Dallas Keuchel has a 13-5 record with an earned run average of 2.96 and a WHIP of 1.12. He has 117 strikeouts over his 139.2 innings pitched and he's given up 111 hits. He allows 7.2 hits per 9 innings and he has a FIP of 3.81. The bullpen has an earned run average of 4.43 and they have given up 471 base hits on the year. Teams are hitting .235 against the bullpen and they've struck out 630 hitters and walked 204 batters. As a team, Houston allows 8.2 hits per nine innings while striking out 9.9 batters per nine innings. They are 11th in the league in team earned run average at 4.18. The Astros pitchers collectively have given up 1,263 base hits and 643 earned runs. They have allowed 185 home runs this season, ranking them 20th in the league. Houston as a pitching staff has walked 505 batters and struck out 1,516. They have walked 3.3 men per 9 innings while striking out 9.9 per 9. They have a team WHIP of 1.28 and their FIP as a unit is 3.94. As a team Houston is hitting .280, good for 1st in the league. The Astros hold a .476 team slugging percentage and an on-base percentage of .344, which is good for 1st in baseball. They rank 1st in MLB with 9.7 hits per game. Jose Altuve is hitting .348 with an on-base percentage of .412. He has 198 hits this season in 569 at bats with 80 runs batted in. He has a slugging percentage of .555 and an OPS+ of 168. Josh Reddick is hitting .314 this year and he has an on-base percentage of .363. He has totaled 150 hits and he has driven in 82 men in 477 at bats. His OPS+ is 134 while his slugging percentage is at .484. The Astros have 1,496 hits, including 327 doubles and 227 home runs. Houston has walked 483 times so far this season and they have struck out 1,030 times as a unit. They have left 1,041 men on base and have a team OPS of .819. They score 5.4 runs per contest and have scored a total of 837 runs this year. Texas has a 76-79 overall mark this year. With an earned run average of 3.80, Cole Hamels has a 11-4 record and a 1.14 WHIP. He has 97 strikeouts over the 142 innings he's pitched. He's also given up 114 hits. He allows 7.2 hits per nine innings and his FIP stands at 4.68. The bullpen has an earned run average of 4.65 and they have given up 501 base hits on the year. Teams are hitting .263 against the Rangers bullpen. Their relievers have struck out 439 batters and walked 221 opposing hitters. As a team, Texas allows 8.9 hits per nine innings while striking out 6.9 batters per nine innings. They are 18th in the league in team earned run average at 4.57. The Rangers pitchers as a team have surrendered 1,363 base knocks and 696 earned runs this season. They have given up 203 home runs this year, which ranks 11th in Major League Baseball. Texas as a staff has walked 540 hitters and struck out 1,058 batters. They give up a walk 3.5 times per 9 innings while they strike out 6.9 per 9. Their team WHIP is 1.39 while their FIP as a staff is 4.86. As a team, they are batting .244, good for 26th in the league. The Rangers hold a .432 team slugging percentage and an on-base percentage of .321, which is good for 18th in baseball. They rank 27th in MLB with 8.2 hits per contest. Elvis Andrus comes into this matchup batting .297 with an OBP of .337. He has 183 hits this year along with 86 RBI in 617 AB's. He maintains a slugging percentage of .475 with an OPS+ of 108. Nomar Mazara is hitting .255 this season and he has an OBP of .327. He has collected 134 hits in 526 at bats while driving in 97 runs. He has an OPS+ of 96 and a slugging percentage of .433. The Rangers as a team have 1,269 base knocks, including 247 doubles and 229 home runs. Texas has walked 526 times this season and they have struck out 1,423 times. They have had 967 runners left on base and have an OPS of .753. They have scored 5.01 runs per contest and totaled 776 runs this season. 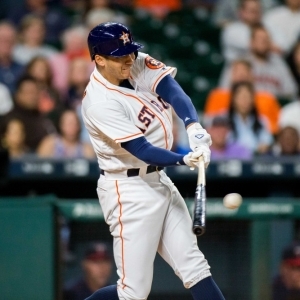 Who will win tonight's Astros/Rangers MLB game against the spread?